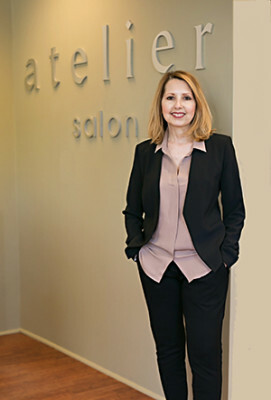 A stylist with more than 30 years of experience, Theresa Chagouris has always been enthusiastic about helping others learn the artistry of hairstyling and haircolor. Over the course of her career, she has had the opportunity to mentor stylists, teaching them and guiding them to develop their eye for color and skill at cutting techniques. In January 2000, Theresa opened her own salon, atelier salon. Small and personal, located in the tree lined historic Roland Park neighborhood of Baltimore, Maryland. With a drive and passion for excellence she has infused her team with enthusiasm and respect for their art. atelier salon is a place where stylists learn and cultivate their craft and together contribute to the world around them.